Puppies Eat the Darnedest Things! I have heard stories of puppies eating rocks, socks and underwear. I have seen, firsthand, puppies chew up hard plastic (indestructible, HAH!) water buckets, collars and leads. My veterinarian, Clarence Bagshaw DVM, has removed rocks from a Cocker spaniel and golf balls from a Labrador retriever. He had one dog who had swallowed a fishing sinker and had the hook attached to it's tongue! Ouch. I have not, until now, witnessed a ten-week old puppy swallowing his collar whole. You all are familiar with my trials and tribulations with "Rec" and the spider bite. I have a new story to tell about Fonzie. Two weeks ago (on a Thursday) Fonzie was running in the yard with his siblings when he stopped and threw up a small puppy collar. This particular collar was 12 inches long and 3/8's inch wide with a small metal buckle. This particular collar had a previous home on Fonzie's neck. Later that day, or maybe the next day, I noticed that Fonzie's sister, Chile, was missing her small puppy collar. I didn't think too much about it since it was black and I didn't remember when I last saw it on her. Sunday evening I brought Fonzie in the house for his turn at being a little spoiled. I take turns and bring one pup in for a few hours each evening and work on fetching as well as house manners. I put a new collar on Fonz - a nice big collar - 14 inches long and 5/8 inch wide with a metal buckle. It is a very pretty blue collar. I put Fonzie back outside with his sisters for the evening. Monday morning. There is Fonzie. No collar. I search and search again in the puppy pen but no collar. Great. I take the little punk to the vet's office to see if the collar has found it's way to Fonzie's belly. Doc induces vomiting. No collar. I search the puppy area again. No collar. I tell the doc to go ahead and x-ray the pup. Yup, it's there alright. I go to the vet's office to observe the surgery and take the baby home afterwards. 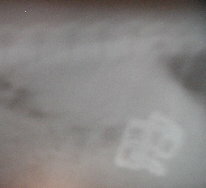 I look at the x-ray and say, "Hey doc, I think that there are TWO collars in this pup." Sure enough, there is his sister's collar buckle nestled next to Fonzie's collar buckle. Doc cuts the pup's belly and gently pulls out Fonzie's stomach.He shakes his head in disbelief. Doc has to make a larger incision than planned to get to the two collars and take them out. The smaller collar buckle was already eroding from the pup's stomach acids. Both collars were UNbuckled - the same as the first collar Fonzie threw up. The pup didn't slip his collar over his head. The pup didn't chew up the collars. He simply swallowed them whole, like spaghetti I guess! The reason for this story is this - if I hadn't been lucky and noticed Fonzie throwing up one collar and then taking him to the vet when the other collar was missing - Fonzie would not be alive. If the doc had not removed the collar within 24 hours of ingestion Fonzie might have died. When foreign objects get into the stomach they eventually migrate to the bowel. Problems occur when the object is too large or too long to pass safely. Intestinal blockage and possible tearing of the intestinal wall can cause peritonitis. What can you do if you suspect your pup ate something he shouldn't have? The symptoms are: constant vomiting, tender abdomen, back arched, drooling, and lethargic. First try to feed the dog some canned food so he has some weight on his stomach. Next give him 1 tablespoon of hydrogen peroxide every 5 minutes for 30 minutes or until he vomits. If he vomits something up, keep monitoring him but he should be okay. If he vomits and nothing comes up - take him to your veterinarian. The Cocker, the Lab, and the dog with the hook and sinker all required surgery to remove the rocks, the golf balls and the sinker. Fonzie is a puppy and so the next morning he showed no signs of having his belly cut open. He is back in with his sisters but now - Nobody wears a collar! copyright 2002 - Web Designs by P.K.